Founded in 1969, Gap Inc., is a specialty retailer offering clothing, accessories, and personal care products for men, women, children, and babies under the Gap, Old Navy, Banana Republic, Piperlime, and Athleta brands. It entered the children's apparel market with the introduction of GapKids in 1986 and BabyGap in 1989. It launched GapBody in 1998 offering women's underwear, sleepwear, loungewear, and sports and active apparel. It launched Old Navy in 1994 to address the market for value-priced family apparel. It launched Piperlime in October 2006 and acquired Athleta in September 2008. It operates stores in the United States, Canada, the United Kingdom, France, Ireland, and Japan, while its independent third-party franchisees own and operate stores in Asia, Europe, Latin America, and the Middle East under the Gap and Banana Republic brand names. As of February 1, 2014, Gap Inc. (GPS) had a workforce of approximately 137,000 employees. At the end ended fiscal 2013 with 3,539 Company-operated and franchise store locations. The following graph outlines the revenue growth of Gap Inc. (GPS) in the last 10 years. 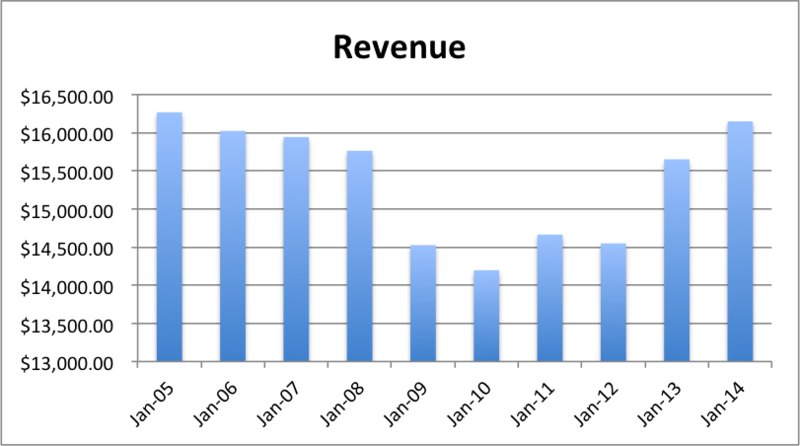 As you can see from the graph above, revenue declined between 2005 and 2010 and then increase again between 2010 and 2014. Overall, the revenue hasn't grown in the last 10 years. Consumer purchases of discretionary items, including merchandise, generally decline during periods when disposable income is adversely affected or there is economic uncertainty, which is confirmed by the drop in revenues during the year 2009, when GFC (Global financial crisis) hit the world and consumer spending was at its lowest. In addition, Gap Inc. (GPS) operates in a business that follows a seasonal pattern, with sales peaking over a total of about eight weeks during the end-of-year holiday period. Over the past 24 months, reported monthly comparable sales have ranged from an increase of 10 percent in July 2012 to a decrease of 3 percent in September 2013. Comparable online sales favourably impacted total Company Comp sales by 3 percent and 2 percent in fiscal 2013 and 2012, respectively. In fiscal year 2013, the company opened 190 Company-operated stores, primarily through expansion in Asia. Specifically, Gap Inc expanded store base in China, opening 34 stores for a total of 81 specialty and outlet stores, and opened an additional 17 Old Navy stores in Japan for a total of 18 stores. The company opened 58 global outlets for a total of 532 outlet stores. It also opened 30 Athleta stores, ending fiscal 2013 with 65 Athleta stores. The franchisees added 72 new stores and five new markets. In fiscal 2014, the company expects net openings of about 115 Company-operated store locations. The table below shows the owner's earnings in the last 10 years for Gap Inc (GPS). 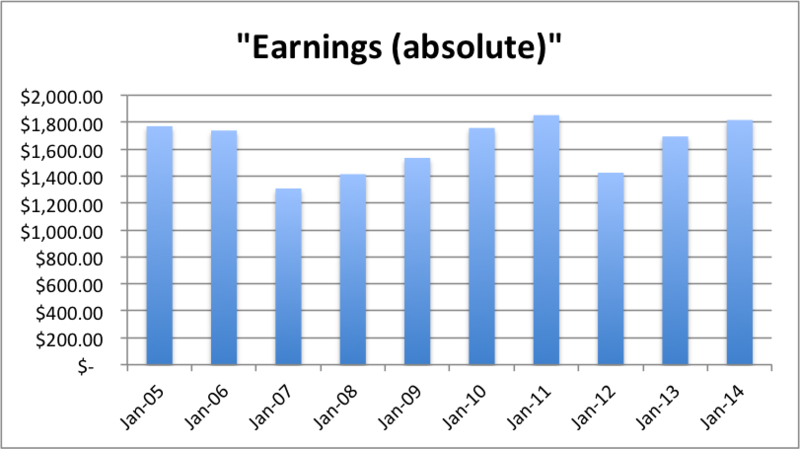 As the graph indicates, the earnings haven't grown much in the last decade. In the last 10 years, the earnings have increased at an average of 1.44% and at a CAGR of .29%,which puts it in under 'No growth' category. Due to the effect of share buyback program, the earnings per share (EPS) has grown at an average of 11.65% and at a respectable CAGR of 9.51%. The Gap Inc. has delivered an annualised return of 9.21% vs 6.97% annualised S&P 500 return. The business is vulnerable to changes in fashion trend and consumer taste and to suboptimal selection and timing of merchandise purchases. The inventory levels build up prior to peak holiday selling season. If sales do not meet expectations, too much inventory may cause excessive markdowns and, therefore, lower than planned margins, thereby impacting earnings. In the last 10 years, Gap Inc. has spent an average of 35% of its owners earnings on "Property, plant and equipment'. 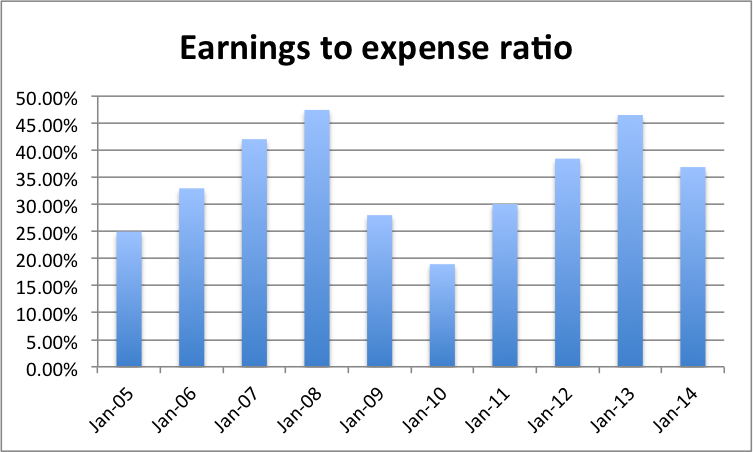 The graph below outlines the 'Earnings vs Expense' ratio in last 10 years. The management team has been quite prudent at making acquisitions, instead of going on a buying frenzy to raise revenue they have been quite focused on making good deals. Gap Inc. has spent a total of $129 million on acquisition and purchase of business in last 10 years. 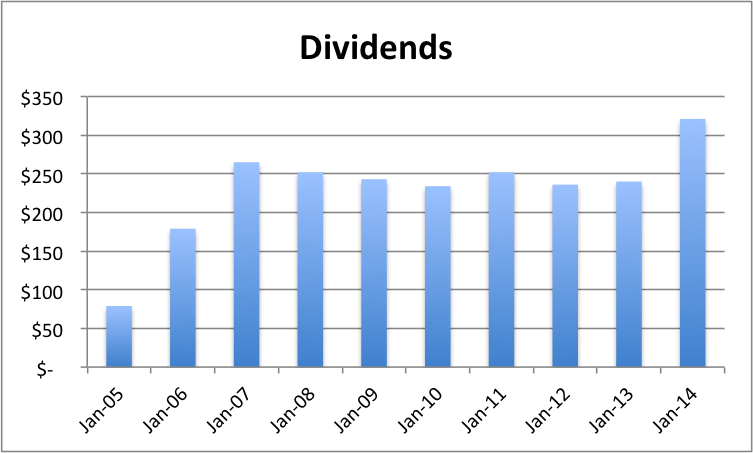 GPS has increased dividends for 10 years in a row, which satisfies one of my investment criteria. In the last 10 years, the dividends have increase at an average of 22.14% and at a CAGR of 16.86%, these number are skewed due the sharp rise in dividend payment in jan-06. Due to the effect of share buybacks, dividend per shares on the other hand has grown at an average of 25.44% and at a CAGR of 22.83%. A CAGR of 22.83 implies, dividends doubling every 3.5 years, these number are skewed due the sharp rise in dividend payment in jan-06. The dividend payout ratio is 17% of the total cash earnings. Gap Inc. (GPS) paid a dividend of $0.70 per share for fiscal 2013. The company intends to increase the annual dividend to $0.88 per share for fiscal 2014. 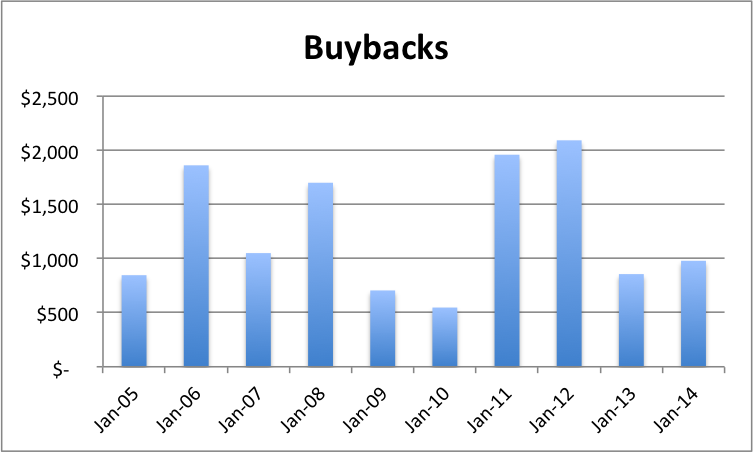 The graph below outlines the total amount of money Gap Inc. (GPS) has spent on buybacks. 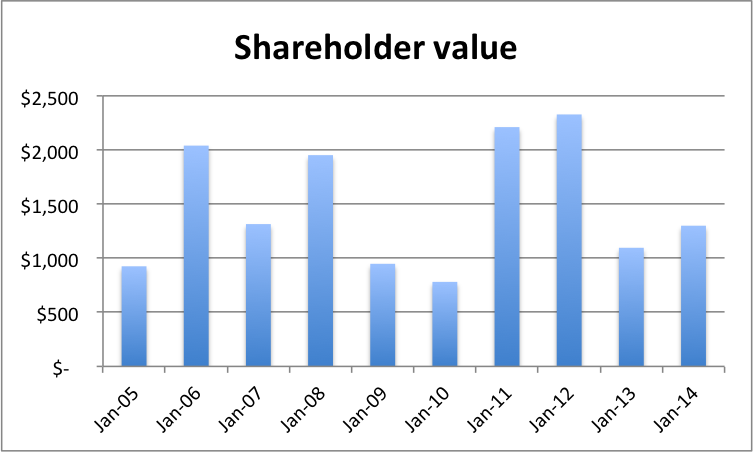 In January 2013, the Board of Directors authorised $1 billion for share repurchases, which was fully utilised as of February 1, 2014. In November 2013, Gap Inc. (GPS) announced that the Board of Directors approved a new $1 billion share repurchase authorisation, of which $966 million was remaining as of February 1, 2014. Gap Inc. (GPS) has been able to bring down the total outstanding shares from 991 million to 467 million in 2014, thereby reducing the total outstanding shares by more than 50%. The graph below outlines the total amount Gap Inc (GPS) has returned back to shareholders in the last 10 years through dividends and share repurchases. On an average GAP Inc. (GPS) has been able to return 65% of its total owner's earnings to shareholders through dividends and share buy backs. The total liability to earnings after capital expenditure is 4.30 which is quite good and meets my investment criteria. Dependence on china for merchandise: Approximately 28 percent of purchases, by dollar value, are from factories in China. Due to the nature of fashion business, it requires anticipating and quickly responding to changing apparel trends and customer demands. The current market cap for Gap Inc. (GPS) stands at $18.47 billion and at a trailing P/E of 16.30. At current share price ($41.91) Gap Inc. (GPS) delivers a dividend yield of 2.10% and shareholders earnings yield of 5.69%. Based on my valuation, I believe Gap Inc. is currently reasonably priced at $41.91 for long term investment.